Islam Around Us: Egypt’s Sinai emerges as new theater for jihad. 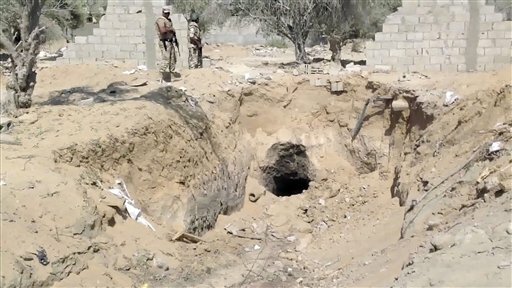 CAIRO | AP | 04 Sep 2013 :: An Egyptian doctor once close to Osama bin Laden is bringing together multiple al-Qaida-inspired militant groups in Egypt’s Sinai to fight the country’s military, as the lawless peninsula emerges as a new theater for jihad, according to Egyptian intelligence and security officials. There have been other signs of a dangerous shift in the longtime turmoil in the peninsula bordering Israel and Gaza since the military’s July 3 ouster of Islamist president Mohammed Morsi, the officials say. With the shifts, Sinai’s instability is becoming more regionalized and threatens to turn into an outright insurgency. Sinai has seen an influx of foreign fighters the past two months, including several hundred Yemenis. Several militant groups that long operated in the area to establish an Islamic Caliphate and attack their traditional enemy Israel have joined others in declaring formally that their objective now is to battle Egypt’s military. Also, Sinai has become the focus of attention among major regional jihadi groups. Al-Qaida’s branch in Iraq last weekend called on Egyptians to fight the military, as did al-Qaida’s top leader, Ayman al-Zawahri. The militant considered the most dangerous man in the Sahara — one-eyed terror leader Moktar Belmoktar, a former member of al-Qaida’s North Africa branch — joined forces with a Mali-based jihadi group last month and vowed attacks in Egypt.